This story begins in the mid-30s when a company named Anders Fischer AB was an authorized seller for Westeråsmaskiner AB, one of Sweden’s biggest manufactures for agriculture machines with worldwide sales. At that time they realized that it was time for the farmers to go from horse to tractor and they searched for a known agency and the choice fell on MM. At that time there were not many persons familiar with the English language in Sweden, so the head salesman Mr.Gösta Axelsson’s knowledge in English became important; therefore, he was the man who had all the contacts with the MM Company. There was a man named Mr.Mortimer who arrived in Sweden from MM to negotiate in the matter. The first tractors arrived 1937 and the last one 1939. The total number of imports was 125-175 units of models R and Z. 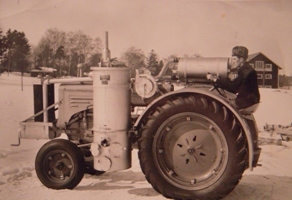 The tractors that arrived in Sweden were mostly used as pullers for all kinds of agricultural machines, or as stationary engines for threshing-mills. After the beginning of World War 2, it was no longer possible to import anything from foreign countries by boat because the Germans torpedoed all the ships they could. All the tractors were delivered from the U.S. in big wooden boxes and my father, K-E Nylander, was responsible for all the handling with the help of Mr. Henry Pettersson (Mr.Pettersson is still alive and in a good health and has helped me with all the facts in this matter). They picked up the boxes by truck from the harbor and assembled and adapted them for use in Sweden. All this work was done in temporary workshops and even in our garage at home. Due to lack of petrol and kerosene during WW 2, the government set up a hard rationing for oil products. The only way to keep the tractors going was to adapt them for wood gas. There were existing aggregates for cars and trucks and with help from parts, my father and Mr. Axelsson constructed and put them up on the tractors. Mr. Pettersson remembers that they worked very well on wood gas, however there were a big risk of fire on the fields when they had to take out the ash and sweep the unit from soot. Likewise, the gas was dangerous, it contained a big part of carbonic oxide, so it was not possible to run and drive the engines inside the shop or garages. The tractors that were imported during 37-39 were sold as new for a long time in the early 40s and they never imported any more tractors from the U.S. after the war. The next tractor brand they took up was the Dieselross tractor. Editors note: Svante Nylander has written this little article after a translation of a memorandum from Mr.Henry Pettersson.